beloved magician of his time. But in the 19th Century, how did one become a magician? Were there books on magic? Was there a course one could take? The most common approach in the 19th Century was to apprentice with a more seasoned professional. Heinrich, who went by Harry, answered an ad in the newspaper looking for a magician's apprentice. When he arrived at the home of the Fakir of Ava, he was met by a dog. The dog licked the boys hand and the gracious magician, whose real name was Isaiah Harris Hughes, invited the boy in. Almost immediately young Harry was told the job was his. When Harry asked why the magician had chosen him, Hughes told the boy that it was actually the dog who had selected Harry. All the previous young men who applied for the job caused his dog to bark and growl. But when Harry arrived, the dog greeted him like a long lost friend. So began Harry's journey into the world of magic. He learned all he could from the Fakir of Ava and eventually attempted to go out on his own. He struggled. Show business was much harder than it looked, especially in the 1800s. Vaudeville had not yet begun. There was no TV, no internet, no radio, no true form of mass communication other than newspapers. And just to give you an idea of how long ago it was, the newspapers did not yet have the ability to print photos in their columns, only line drawings. But Harry forged ahead, eventually teaming up with the world famous Davenport Brothers. These were two brothers who were taking the world by storm with their Spirit Cabinet effect. The Spirit Cabinet and the spiritual phenomenon that was produced altered the world of magic in many ways. Magicians recognized that the feats by so-called spirit mediums were fake, soon began to feature acts in which they exposed these feats. It was like an early public service that magicians provided to keep people from being swindled. However, not everyone chose the exposure route, some featured the Spirit Cabinet and related phenomenon and even expounded upon it. Harry, while working as assistant to the Davenports discovered their secret. At some point Harry had gotten into an argument with one of the brothers and left their employment. But he did not go alone. William Fay left as well and in the Spring of 1873, Fay and Kellar teamed up and began to tour with a show. They struggled initially with their act, but their luck turned when they went to Cuba and then onto Mexico and South America. Fay and Kellar were a big hit suddenly and were ready to take their new found success to Europe. They booked passage on the Royal Steamship Boyne and headed to Portugal. But their luck was about to run out. The ship struck ground off the coast of France and sunk. Aboard the ship was all the money, gold, and jewels they had accumulated during their tour, along with all of their props and costumes. All was lost. And that was also the end of the partnership between Kellar and William Fay. But that was not the end for Harry Kellar. While in Europe Harry Kellar purchased a prop called A Vanishing Birdcage. This was the invention of French Magician Buatier DeKolta and the prop was sold to Kellar by a cousin of DeKolta's without DeKolta's permission or knowledge. Harry took the cage back to America and sold it to a magic dealer in exchange for having his entire show rebuilt. Within a few months, The Elusive Cage or Vanishing Cage as it was known, was all the rage with almost every magician in the U.S., including Harry Kellar. And you have his superior in Kellar!" Now Harry only had one main competitor and they would fight for the title of best magician in America for many years. Clearly, Harry was the best American born magician, but he had stiff competition with Alexander Herrmann, who actually was born in France. Herrmann the Great as he was known was a charming performer and had a very mephistopholean appearance. In fact, he has actually gone on to become the iconic image of a magician. When people draw a magician with a top hat and a mustache, they are actually drawing the image of Herrmann, whether they realize it or not. 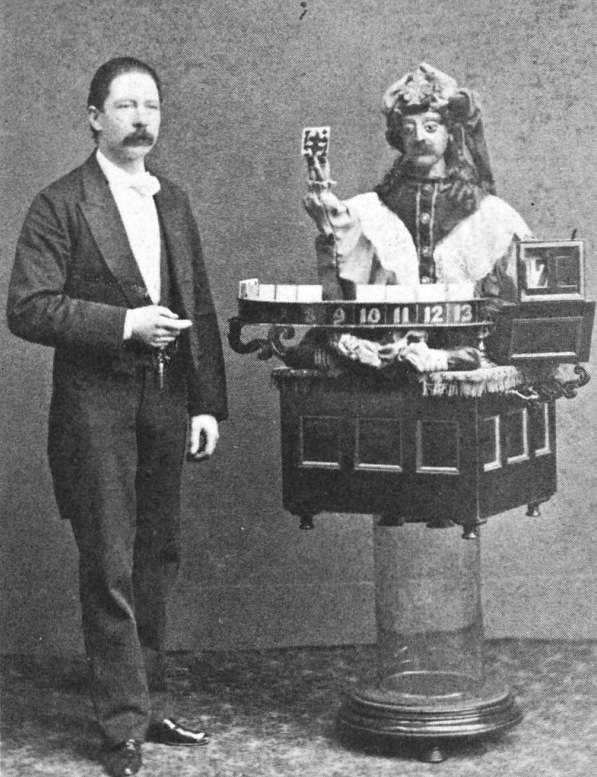 The two rival magicians had something in common, at some point in time they both hired William Ellsworth Robinson to work behind the scenes in their shows. It was said that Robinson was the most knowledgable man in magic and both Kellar and Herrmann would take full advantage of that. Robinson would eventually go off on his own and have tremendous success in England with a very different sort of magic act. In 1896, while on tour in the U.S. Alexander Herrmann died on board a train. The nation mourned his passing. This also meant that Kellar no longer had any serious competition for the #1 spot in the U.S. and he quickly rose to gain that title. Kellar became beloved by the American public. It is said that Harry Kellar was the inspiration for the character of the wizard in the L. Frank Baum story, The Wizard of Oz. As beloved as he was in America, there were a few people who felt the opposite, the Maskelyne family who were running Egyptian Hall in England. During the summer months, Kellar's show would close in America. This was due to the theatres not having air conditioning. So Kellar would go to England to try and find new material for the coming season. The greatest source of new material was at Egyptian Hall run by John Nevil Maskelyne. Kellar could work out no deal with the Maskelynes, so instead he would either find someone in England willing to recreate their illusions or he would figure it out himself and have it build in America. Probably the greatest item Kellar stole from Maskelyne was their levitation. John Nevil Maskelyne refused to sell the rights to the illusion so Harry did something very clever. He hired one of the acts that had worked with the Maskelyne show to come to America and work with him. Together they built a new version of the Maskelyne levitation, but they vastly improved it over what had been made before. Today it's known as the Kellar Levitation rather than the Maskelyne Levitation. J.N. Maskeylene also created a number of automatons. The most famous of which was called Psycho. The original Psycho sat on a table with a clear tube underneath that showed their was no one concealed beneath the table nor was there anything connected to the automaton. Then the little figure would play a card game called Whist. Psycho was a remarkable figure and audiences loved it. 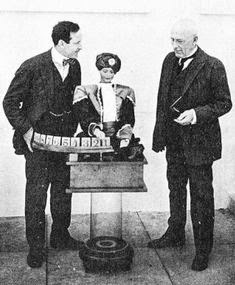 Kellar was able to find someone to build this automaton for him and he returned to America with his own version of Psycho. The Kellar version differed only in the facial features of the figure and the costuming. Otherwise Kellar's Psycho performed just as well. After Kellar retired, he gave Psycho to his close friend Harry Houdini. Today, the Kellar Pyscho Automaton survives in the historical collection of John Gaughan. In May of 1908 on the stage of Ford's Theatre in Baltimore Md., Harry Kellar passed his Mantle of Magic onto his successor Howard Thurston. Kellar moved to California where he enjoyed retirement by fishing. He always kept one foot in the magic world and at one point was coaxed out of retirement by his friend Houdini for one performance in NYC. 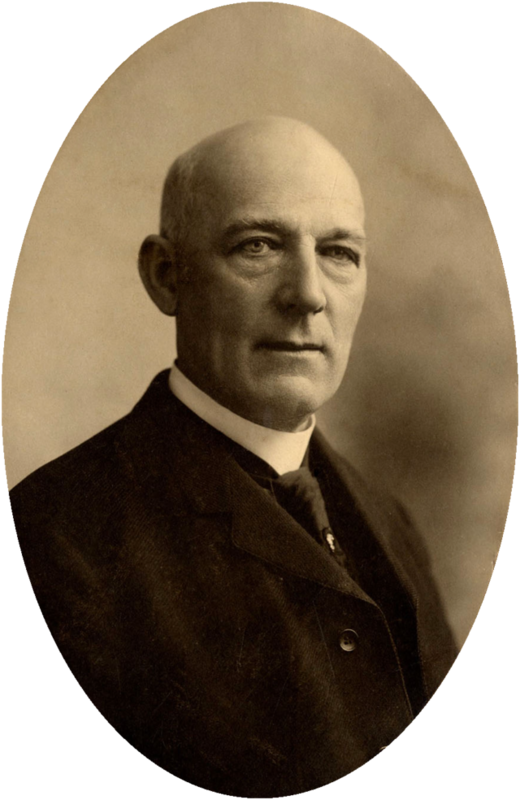 Harry Kellar passed away in March 10, 1922. 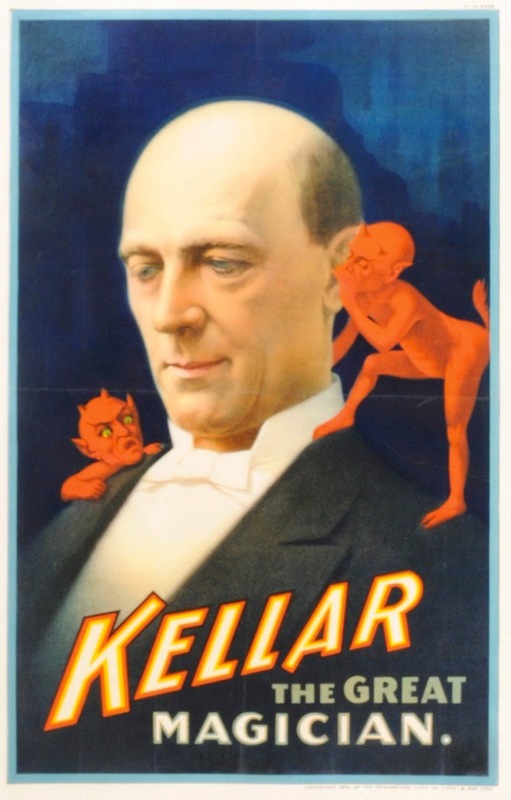 If you'd like to read more about Kellar, I've written a number of articles about him on my magic history blog at http://www.themagicdetective.com/search/label/Harry%20Kellar Kellar was a unique person in the history of show business. 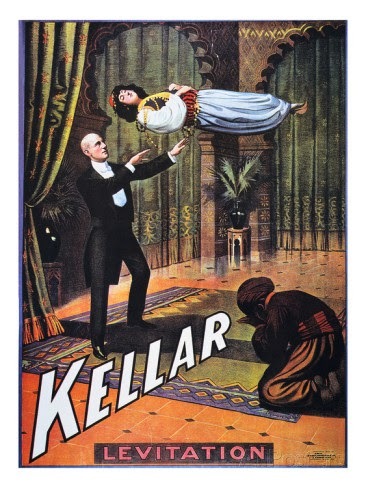 Also, if you'd like to find a book on Kellar there is one available through Amazon called The Amazing Harry Kellar: Great American Magician.